The Arizona Game and Fish Department yesterday collected a dead, intact carcass of a cat resembling an ocelot, a rare small to medium-sized cat that is listed as a federally endangered species. The animal reportedly was accidentally hit and killed by a motorist on Sunday, April 18 on Highway 60 between Superior and Globe. In cooperation with the U.S. Fish and Wildlife Service (FWS), the Department is in the process of shipping the carcass to the Service's national forensics laboratory located in Ashland, Oregon, where it will undergo testing to determine if the cat is actually an ocelot of wild origin. “Currently, we have no reason to suspect that this is anything other than a wild, naturally occurring ocelot and genetic analysis should help with verification,” said Eric Gardner, the Department nongame and endangered species program lead. “Although not legal to possess in Arizona under most circumstances, ocelots are actually fairly common in the pet trade and genetic testing may help us determine its origin or if this was a captive-raised animal.”. . . . .
Photo was taken in Summer of 2008. 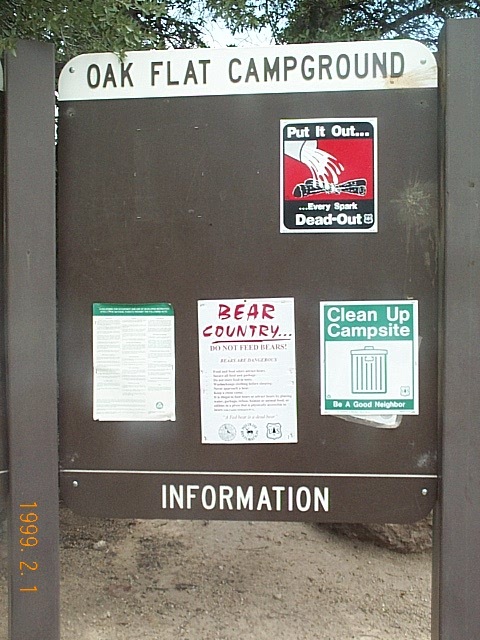 The Bear Country sign disappeared in 2009. Did the bears disappear? Have the current operations of Resolution Copper already affected the wildlife?